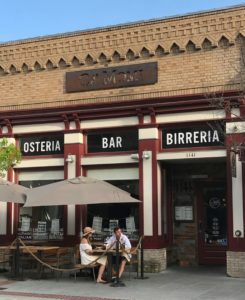 Are you looking for a good Downtown Napa Happy Hour but aren’t sure where to go? Well, brace yourself, because downtown Napa has 21 Happy Hour destinations to choose from. All of these are on the western side of the Napa River, between Caymus Street and 5th Street. You may even want to gather some friends and start a Progressive Happy Hour one night. Your group can easily enjoy Pizza, Nachos, and/or Fried Calamari at reduced prices along with great drink discounts. Or, since this is Napa Valley you will also find Dolmas, Lobster Corn Dogs, Chicken Empanadas and Smoked Duck Sliders on those Happy Hour menus. Looking for drink specials? Depending on what you’re thirsty for, you’ll find downtown Napa Happy Hour prices starting at $3 for Beer, with discounts on everything from Napa Smith Pilsner (Napa Valley Bistro) to Guinness (Bounty Hunter) to Craft Beers brewed by the house (Napa Palisades Saloon). Prices for selected glasses of Wine start at $5 (Ca’ Momi Osteria), or you can swing by Velo Pizzeria on Tuesdays when all bottles are 40% off. If you’re in a cocktail mood, Well Drinks start at $5 at Ristorante Alegria or you can explore the standards with a Martini from Torc ($7), a Margarita from Don Perico ($4.50) or a Moscow Mule at either Mercantile Social or Mercantile Terrace at the Andaz Hotel ($7 on Mondays). 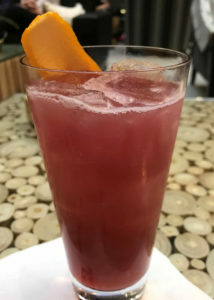 Other options include Pisco Sours at Napkins ($7), Harvest Punch at Basalt ($9), or an “El Diablo” with Tequila, Mezcal, Crème de Cassis, Ginger, Lime and Spicy Bitters at Charlie Palmer Steak ($7). To go with your drink, you may want to start with Buffalo Wings at Downtown Joe’s ($8), Carnitas Tacos at Gran/Eléctrica ($7) or Chili and Cheddar Fries at Norman Rose Tavern ($9). Then you can move on to other downtown Napa Happy Hour Appetizers such as Tempura Green Beans at Eiko’s ($5), Macaroni and Cheese at Grace’s Table ($5), Turkish Meatballs at Tarla Mediterranean Grill ($9), Mushroom Flatbread at Carpe Diem ($9) or Short Rib Sliders with Horseradish Cream at Celadon ($10). If your weekday work schedule (and commute) makes typical Happy Hour participation difficult, don’t despair. 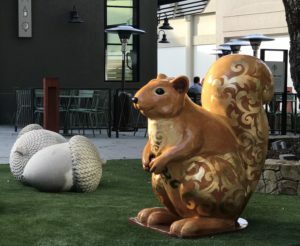 Many of these downtown Napa Happy Hour establishments extend their discounts through the weekends as well so a collective “Thank You” to Andaz Hotel, Basalt, Ca’ Momi, Charlie Palmer Steak, Compline, Napkins, Tarla, and Torc for doing that. Also, Carpe Diem offers Happy Hour on Saturdays. Keep reading and we’ll tell you about 21 opportunities in Downtown Napa for great food and drinks at reduced prices. Of course, Happy Hour items and prices are subject to change so you may want to start working your way through the list below soon. Please assume (unless you discover otherwise) these offers are only good in the restaurants’ bar areas. Allegria (1026 First Street, 707-254-8006) – Monday through Thursday, from 5:00 p.m. to 6:15 pm, and Friday between noon and 4:00 pm, mixed Well Drinks are $5 and beer is $3.50. Happy Hour food specials include Calamari Fritti for $8, Homemade Meatballs for $8.50, Spaghetti alla Bolognese for $8.50, and an Arugula Salad with Dungeness Crab Cake and Poached Pears for $10.50. Or, you can order a Kobe Burger with Jack Cheese and Fries for $8.50, then add Mushrooms for $1 or Bacon for $3. Andaz Hotel (1450 1st Street, 707-687-1234) – Daily, from 6:00 to 8:00 pm, the Napa Andaz Hotel offers two locations for downtown Napa Happy Hour fun: Mercantile Social on the 1st floor, and Mercantile Terrace on the 2nd floor. Each day has a Specialty Cocktail offer, such as Moscow Mules on Mondays and Dark and Stormys on Thursdays. 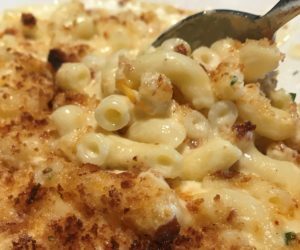 There aren’t any food specials but the extensive food menu includes Roasted Mixed Nuts, Jalapeño Poppers, Truffled Mushroom Arancini, Lobster Mac and Cheese, Soups, Salads, Sandwiches and Desserts. 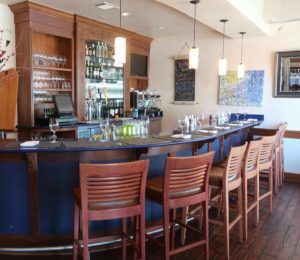 Basalt (790 Main Street, 707-927-5265) – Daily, from 5:00 pm to 6:30 pm, Basalt offers a selected draft beer for $5, selected wines for $9, or a Harvest Punch with Rye, Pear Liqueur, Pomegranate, Lemon and Spice for $9. For $6 each, small plates include a Wedge Salad with Green Goddess Dressing, Chicken Wings with a Soy-Ginger Glaze, Beer Battered Fish Taco with Pineapple Salsa, Fried Chicken Slider with Spicy Remoulade, or St. Louis Pork Ribs with Coleslaw and Bread and Butter Pickles. Bounty Hunter Wine Bar & Smokin’ BBQ (975 First Street, 707-226-3976) – Monday through Friday, from 3:00 pm to 6:00 pm, Happy Hour drink specials include ½ price selected wines, for both 2 oz and 5 oz pours. Recent choices included Bodega Garzon Albariño, Waypoint Chardonnay and Sans Liege Grenache. 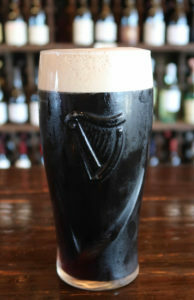 Draft beers are also ½ price such as Guinness, Weihenstephaner or another seasonal choice. Try out the Smokin’ BBQ food with deals such as $6 for a Rib & ’Slaw Appetizer or an $11 Sampler Plate which also includes Brisket. Ca’ Momi Osteria (1141 First Street, 707-224-6664) – Daily, from 5:00 to 7:00 pm, and then from 9:00 pm to closing, the house wines and draft beers here are $5 each. Draft beers include Lagunitas Little Sumpin’ Ale and North Coast Brewing Company Brother Thelonious. You can order any of the Pizzas here for $5 off, with toppings such as Carciofi & Porcini, Speck & Brie, Porcheta & Rucola, or the Norcina (with Pork Sausage, Wild Mushrooms, and Smoked Buffalo Mozzarella). Ca’ Momi also offers a daily “PMS” special for $15 which comes with a Pint, a Margherita Pizza and a Spritz. Carpe Diem Wine Bar (1001 Second Street, 707-224-0800) – Monday through Saturday, from 4:00 pm to 6:00 pm, enjoy $2 off draft beers, selected glasses of wines for $7 each, or the “Dealer’s Choice Cocktail” for $8. Here, downtown Napa Happy Hour noshing options include Chef’s Tacos for $3 each, Mushroom Flatbread for $9, or a Five Cheese or Charcuterie Board for $14. We also highly recommend the Carpe Diem Salad with Candied Walnuts and Cabernet-Reconstituted Cherries for $6. Celadon (500 Main Street, Suite G, 707-254-9690) – Monday through Friday, from 4:00 pm to 6:00 pm, selected beers are $4 and selected well drinks and glasses of wine are $6. To eat, your choices include Chicharrones with Salsa Verde for $5, Short Rib Sliders with Horseradish Cream for $10, and a Burger for $10 where you can add Cheese (+ $1.25), Applewood Bacon (+ $1.50), Avocado (+ $1.75) and/or accompanying Fries (+ $5). 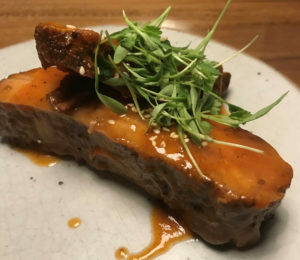 Charlie Palmer Steak (at Archer Hotel, 1260 First Street, 707-819-2500) – Daily, from 4:00 pm to 7:00 pm, the draft beers are $4 including Warsteiner Dunkel, Tannery Bend Coombs Saison, and Lagunitas Brown Shugga. Selected glasses of wine (sparkling, white, red) are $7 and selected cocktails are $7 such as Manhattan (with Dickel Bourbon) and El Diablo (with Casa Noble Blanco and Mezcal). This is one of the most popular downtown Napa Happy Hour destinations, where Small Plates for $7 include Crisp French Fries with Chipotle Aioli, Veal and Ricotta Meatballs over Fontina Polenta, and Lobster Corn Dogs. Or, you can order a “Burger + Brew” combo with a draft beer and Charlie Palmer’s Five Dot Burger for $20. Compline (1300 1st Street #312, 707-492-8150) – Daily, from 9:00 to 11:00 pm, this wine bar, restaurant, and wine retail shop from Master Sommelier Matt Stamp and Ryan Stetins offers “Family Hour” with a $20 special for an Entrée paired with a selected glass of wine. The selection changes weekly, and past examples include Lasagna and Chianti, Pork Buns and Riesling, and Tostones con Pollo with Salsa Verde paired with a Scheurebe from Weingut Pfeffingen. Don Perico (1106 1st Street, 707-252-4707) – Monday through Friday, from 11 am to 6 pm, Don Perico’s House Margaritas are $5.50 and all of their beers (such as 805, Corona, Lagunitas, Modelo and Pacifico) are just $3.50. Menu items are regular price but Appetizer choices include Shredded Chicken Flautas for $7.95, Guacamole Dip and Chips for $8.65, Shredded Beef Quesadilla for $9.95, and customizable Nachos (Beef, Chicken, Chile Verde, Carnitas, or Fajitas toppings) for $9.95-$12.95. Downtown Joe’s (902 Main Street, 707-258-2337) – Monday through Friday, from 4:00 pm to 7:00 pm, the house-brewed ales are $2 off per pint, including Golden Ribbon Pale Ale, Double Secret Probation IPA, Raspberry Blonde Ale, Worth’s Leprechaun Stout and REBOB Porter. Or, you can order a pitcher for $12 (Double IPA pitcher is $15). The “Hoppy Hour” appetizers include Beer Garlic Fries for $5, Pretzel Bites with Warm Beer Cheese for $5.55, Buffalo Chicken Lettuce Wraps for $7, Warm Artichoke Spinach Dip for $7.50, and Buffalo Wings for $8. Eiko’s (1385 Napa Town Center, 707-501-4444) – Monday through Friday, from 4:00 pm to 6:00 pm, the “Social Hour” beverage choices include Coors Light for $3, Craft and Imported Draft Beers for $5, Well Drinks for $6 and a 10 oz carafe of Hot Sake for $8. Food choices for $5 include Edamame, Tempura Green Beans or an 8-piece plate of California Roll. For $9, options include Fried Calamari, ½ dozen Miyagi Oysters, or a 4 piece serving of Hamachi Jalapeño Sashimi. Grace’s Table (1400 Second Street, 707-226-6200) – Monday through Friday, from 3:00 pm to 6:00 pm, the extensive menu of food items at a reduced price include Chili D’Espellette Fries or Semolina Fried Onion Rings for $4, Fresh Fish Tacos or Macaroni and Cheese for $5, Beef Empanada for $7, Hanger Steak Bruschetta for $8, or a Prosciutto Plate with Gorgonzola Dulce and Riesling Poached Apricots for $9. If you’ve never had fried pickles, the Frickles with Buttermilk Herb Dip is just $5 at this downtown Napa Happy Hour. Beverage choices include over 20 wines by the glass, a dozen bottled beers and 6 Beers on tap (including Black Butte, Brother Thelonious and Firestone Walker choices). 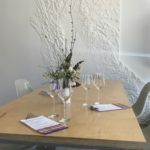 Gran/Eléctrica (1313 Main, 707-258-1313) – Monday through Friday, from 5:00 pm to 6:30 pm, downtown Napa’s newest Mexican restaurant (branching out from its Brooklyn mothership) has already launched a Happy Hour. Margarita Eléctrica, the house margarita featuring Chinaco Blanco Tequila is only $8 and wines by the glass are $2 off regular price. 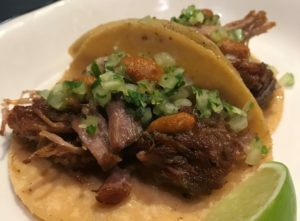 You can also take $2 off your choice of Tacos (2 per plate) including Verduro (seasonal vegetables), Pescado Estilo Ensenada (beer-battered fish), Tinga de Pollo (with Bassian Farms chicken) and Carnitas (with Llano Seco pork). Napa Palisades Saloon (1000 Main Street, Suite 100, 707-296-1552) – Monday through Friday, from 3:00 pm to 6:00 pm, you can enjoy any Napa Palisades Beer Company pint for $4 (such as Loco IPA, Gold Rush Red Ale, and Conductor Kolsch). All other draft beers are $1 off. Happy Hour Bites have included Adobo Chicken Tacos for $3, Mushroom Toast for $4, and Smoked Duck Slider for $5, or “Two Balls and a Beer” where $7 will get you 2 Rueben Croquettes and a Palisades Pint. There are also daily specials such as Moscow Monday ($5 Moscow Mules and $2 Garlic Fries) or Fiesta Friday with $5 Sangria and $4 Chorizo Fries. Napa Valley Bistro (975 Clinton Street, 707-666-2383)– Tuesday through Thursday, from 3:30 pm to 6:00 pm, and Friday, from 3:30 pm to 5:00 pm, beverages include selected glasses of wine, a Champagne Cocktail and a House Sangria for $5. Beers (Coors Light, Napa Smith Pilsner and Modelo Especial) are just $3, and for non-alcohol drinkers Lemonade, Limeade and Arnold Palmer beverages are available for $3. For $6 each, Happy Hour food choices include Crispy Calamari, Spicy Buffalo Wings, Mexican Shrimp, Beer Battered Fish Tacos, Chicken Empanada and BBQ Pork Sliders. Another tasty option is a serving of “Ozzie’s Fries” which are topped with Chili Garlic Sauce and Feta. Napkins Bar + Grill (1001 Second Street, 707-927-5333) – Daily, between 3:00 pm and 6:00 pm, draft beers are $4, well cocktails are $6, Moscow Mules and Pisco Sours are $7, and Coconut-infused Rum Daquiris are also $7. Selected wines by the glass are $7 too. These downtown Napa Happy Hour food items change seasonally but currently include Guacamole, Queso Fundido or Caesar Salad for $7 each, Wedge Salad with Bacon and Blue Cheese Dressing for $9, Crispy Calamari or Charbroiled Lamb Sliders for $10, and a Loaded Niman Ranch Burger (with Cheese) for $12 (and Sea Salt French Fries are just $4 more). Norman Rose Tavern (1401 First Street, 707-258-1516) – Monday through Friday, from 3:00 pm to 6:00 pm, Norman Rose offers drink specials such as $5 draft beers ($3 for Coors) and two different $6 wine specials by the glass. The Happy Hour food menu includes $4 Beef Sliders, $9 Hot Wings, or you can explore their regular menu including French Fries variations such as “Natural” (Sea Salt & Black Pepper) for $4.50, “BBQ” for $4.95, “Truffle & Parmesan” for $7.95, “Disco” (Sausage Gravy & Cheddar Cheese) for $9.95, or “Chili & Cheddar” (All Beef Chili) for $9.95. 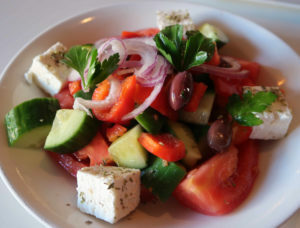 Tarla Mediterranean Grill (1480 First Street, 707-255-5599) – Daily, from 3:00 pm to 6:00 pm, well drinks are $7, selected wines by the glass are $5, draft beers are $4, bottled beers are $4, or you can try a Turkish Beer for $5. There is an extensive list of mezes here including Greek Salad for $7, Kale Salad for $7, Dolmas for $6, and Turkish Meatballs for $9. Or, you can order a Greek Dip Trio of Hummus, Baba Ghanoush and Tzatziki served with Warm Pita for $7. In addition to Happy Hour lasting from 3 pm to 6 pm, Tarla also offers these Happy Hour specials past 6 pm until closing Sunday, Monday, Tuesday and Wednesday. TORC (1140 Main Street, 707-252-3292) – Daily, from 5:00 pm to 6:30 pm (except on Tuesdays when TORC is closed), drink specials include their house Pale Ale or Scrimshaw Pilsner for $4, or selected wines by the glass for $6. Classic Cocktails are $7 each such as a Martini, Manhattan, Margarita or an Old Fashioned. Happy Hour bites for $5 include Deviled Eggs with Pickled Onions and Bacon, a Bengali Sweet Potato Pakora with Yogurt-Truffle Dip, and a wonderful Quesadilla with Schmitz Ranch Short Rib and Sharp Cheddar Cheese. They also recently offered a Tempura Asparagus with Lobster-Yuzu Mayonnaise for $11. 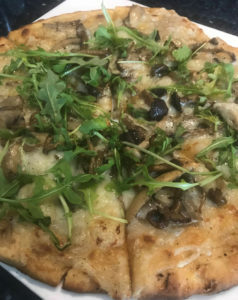 Velo Pizzeria (807 Main Street, 707-492-3975) – Wednesdays and Thursdays, you can consider All Day as Happy Hour with $4 draft beers (such as Trumer Pils, Drakes “Best Coast” IPA and Henhouse IPA) and $6 draft wines (such as Ballentine “Maple Station” White Blend, Beckmen Cuvée Le Bec Red Blend and P.W.R. Petite Sirah). On Tuesdays, all bottles of wine are 40% off (including Stony Hill Chardonnay, Burgess Cellars Grenache and Sequum “Kidd Ranch” Zinfandel). Bring your friends on Mondays because if you buy one Pizza the second one is just $5. The Pizza Menu here (ranging from $15 to $25.50) includes Classic Cheese, Margherita, Mushroom, Pepperoni, or Artichoke, or y’all can get the Meat Supreme Pizza with Pepperoni, Salami and Sausage. FYI, they also make Gluten Free Crust Pizzas. That was just an introduction to the Downtown Napa Happy Hour specials you can take advantage of, and there are many more items on the menus we didn’t list. But once you’ve covered all of those, rest assured there are over a dozen more Happy Hour specials in Napa including just across the river at Oxbow (Kitchen Door), near the movie theaters (Forge), across the street from the hospital (Trancas Steakhouse), or over in Browns Valley (Hop Creek). 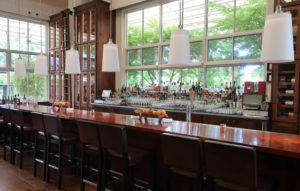 There are also plenty of Happy Hour destinations upvalley such as those in Yountville (Brix), St. Helena (Press) and Calistoga (Bosko’s Trattoria). We’ll be visiting and covering those options in later articles. A lot of locals think best happy hour in Napa is at Frida’s Mexican Grill. Thery have happy hour seven days a week from 3 to 6 pm.